A miracle happened that year: I first put pen to paper whilst reading Susan Jeffers’ book Feel The Fear And Do It Anyway. Her book had a life changing and miraculous effect on me. Susan’s book content was so profound that it got me inspired: I started to make notes of inspiration in the book itself and I jotted down some ideas. However, the more I kept reading the more ideas kept pouring in. As I run out of free space in Susan Jeffers’ book I ended up typing my first ever manuscript on my laptop! The first draft of my manuscript was interesting! :). I still have it to this date. I asked a graphic designer friend to design the cover for me. I created also an A4 spiral bound copy so that I could get a couple of friends to give me some feedback. It was definitely work in progress... Then I got better and better. In 2010 I also entered a book competition. I believed it was a good incentive to get my first book idea completed. In 2015, I read the story of Uzair Patel and Rosie Paterson. The article was published in a British national newspaper and it was entitled: “Under pressure: Burning out on the Square Mile.” This article written by Alice-Azania Jarvis covered the increasing suicide rate and employees burn out in the City of London and how life can be hard for young ‘white collars’ who are high achievers starting up. I was deeply touched by the content I read in the above article. I knew there was another way and a healthier solution. I felt wholeheartedly compelled to share with the world how to regain a sense of balance, inner peace and happiness. Before I started writing YES! TO Love™ I sought professional help on book writing in order to make my idea become a reality faster. I was granted a book architect/coach I was accountable to who monitored my progress. The greatest advice I received was to write from inspiration. I loved the idea of letting the writing flow through me seamlessly. Getting the manuscript became my ‘One Thing’ as I focused relentlessly on writing daily by following a clear roadmap. I would not have completed the manuscript without the help of my book architect. He set a deadline for completion, which made me really move into action. I had a goal and I stuck to it. The way I wrote from inspiration was to first set the intention from the start to provide my readers with great information that can help them transform their lives and live a life of balance on a daily basis. Yet, the completion of YES! TO Love™ did not happen without hurdles. I remember a time during the editing process when I hit the ‘terror barrier.’ The ‘terror barrier’ is like an obstacle or roadblock, which gets in your way and you feel paralyzed by fear. One day while I was editing the manuscript I was overwhelmed by fear out of the blue. I asked myself: “what if people judge me and criticize me?” F.E.A.R stands for False Expectations Appearing Real and I was creating a story in my head, which was breaking my stride and stopping me from getting YES! TO Love™ published. My subconscious belief that everything had to be perfect held me back and could have stopped me from getting the book out to the world. Susan Jeffers said: “feel the fear and do it anyway.” As a result, I overcame the fear of failure or not being good enough by looking at my situation from a different perspective. I stopped centering my thinking around me as the author and I revisited my WHY, why I was writing YES! TO Love™. My WHY was simply to save lives after the alarming article I had read, to spread happiness and the message that Love is the answer to a happy, joyful, peaceful and miraculous life. After this realization it all became clear that YES! TO Love™ was serving a bigger purpose and getting it published was my worthy goal. My key message is that when you live a love centred life it becomes much simpler; you can bounce back, regain your zest for life and turn it around. YES! TO Love™ became my brainchild. Since then I have never looked back. I believe that the early writing years were pure practice. If you are a forthcoming author reading this article and you struggle with getting your manuscript out, keep focusing and writing! Trust that everything in your life is in perfect divine timing and order. 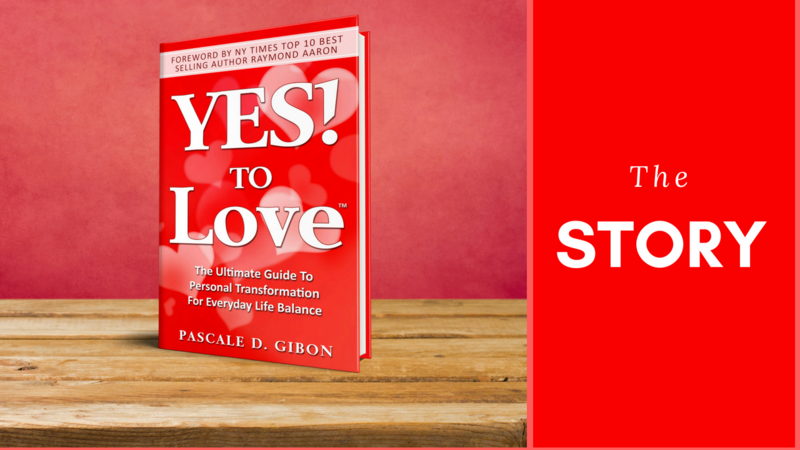 Love is your salvation, therefore: change your life and say Yes to love today! "The feeling of contentment and inner peace derives from the belief and faith that there is always a spiritual solution to any problem you might face. When you adopt inner peace, in every aspect of your life, this becomes your foundation for a balanced life."